In this episode, New York-based psychotherapist August Goforth reflects back on his childhood and relives the crucial events that influenced his spiritual and psychic development. August talks about a life altering NDE, the relationship between his spiritual and sexual awakening, and also revisits the death and believed reunion with former life-partner and co-author of the Risen book series, Timothy Gray. Join us for this fascinating interview which touches on some of the emerging ethical issues that surround the transition of new paradigm healers into the field of mainstream mental health. 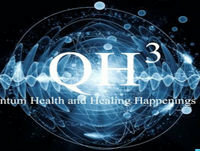 Visit www.qhcubed.com for links to our Youtube channel and listener forum.